Charlene joined Chambers in October 2017 following successful completion of her pupillage under the supervision of Barry McElduff and Adrian Fleming. She receives regular instructions for cases in London and on the Western Circuit. 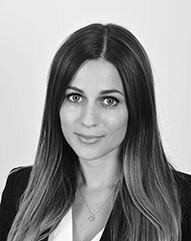 During pupillage Charlene focused predominantly on crime, but additionally gained experience in civil and immigration. Prior to commencing her time with Chambers, she gained considerable experience as an in-house advocate representing clients in a range of civil matters and as paralegal in a set of Chambers in Gray’s Inn. Charlene regularly receives instructions to defend and prosecute in both the Crown Court and the Magistrates’ Court for all types of hearings and has been a Grade 1 Prosecutor since May 2017. Charlene has received instructions on a wide range of offences including sexual offences, offences against the person, dishonesty/fraud, drugs and public disorder. Charlene has appeared as a led junior for both Defence and Prosecution. R v S & others (2018) – Led Junior in successful prosecution of 5 youths jointly charged with committing grievous bodily harm with intent. R v G & others (2018) – Acquittal of Defendant in fraud and computer misuse offences, where two Co-Defendants were convicted. R v L (2018) – Acquittal of Defendant in domestic burglary with forensic evidence linking to point of entry. R v K (2018) – Acted for the Defendant in trial involving multiple counts of Robbery. R v C (2018) – Prosecution under the Dangerous Dogs Act and the imposition of a Destruction Order following a dog causing serious injuries. R v K (2017) – Representing a Defendant for sentence for class A PWITS involving “cuckooing” where K had had played a significant role. The Court was persuaded to take an exceptional stance and depart from the guidelines, imposing a suspended sentence order. R v K (2017) – Prosecuting “operation Puya” – conviction for PWITS and supply of class B in a £800,000 operation where K played a significant role. R v C (2017) – Successful prosecution of PO offence involving 5 child witnesses. Charlene regularly receives instructions for RTA and credit hire claims, and personal injury matters. She has experience in acting in possession actions against tenants, mortgagees and trespassers, as well as for related property disputes. She has further experience in contractual disputes, bankruptcy and insolvency.